Welcome to our website! My name is Sheryl Crosier. I’m the author of the books, “I’m Not a Syndrome — My Name Is Simon” and “Hello, My Name is Simon,” as told by Simon’s big brothers. The purpose of this website is to let you know more about the books and the chromosomal disorder, Trisomy 18, also known as Edward’s Syndrome. Simon’s story was also features in an award winning documentary, “Labeled.” We will also keep you updated on Simon’s Law, a parental decision making bill. My son, Simon Dominic Crosier was born on September 7, 2010, in St. Louis, Missouri. 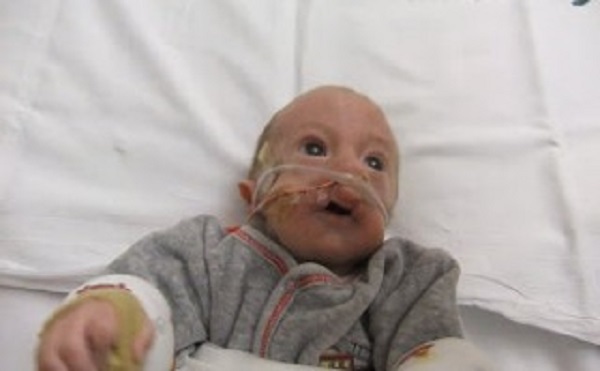 He was diagnosed with Trisomy 18, and lived for 3 memorable months before passing away in December 2010. Despite his disabilities, Simon had a huge impact on all who came into contact with him. Simon’s big, expressive eyes communicated a wisdom that transcended his innocence. The book is about Simon’s short and meaningful life, his family and his wonderful caregivers. But more importantly, this story documents our family’s battle to advocate for our precious son. We had to overcome challenges put in our way by the medical community and even extended family members who never valued Simon’s fragile existence the way we did. We sincerely hope this story will help motivate health-care professionals and anyone else that reads this account. We want them to understand that special-needs children are God’s gift to us all. Their lives possess inherent dignity and value, and they deserve the best care. I invite you to read the excerpts posted on this website to get a preview of the book. We invite your comments and questions, and thank you in advance for your interest in our story and in standing up for kids with Trisomy 18 and other special needs. Simon’s books are available on Amazon in both print and e book versions. Read an excerpt from the book, “I’m Not a Syndrome — My Name Is Simon,” now available for purchase in all e-book formats from publisher All Star Press. Editor’s note. This is the latest in an ongoing series of stories about a proposed law in Kansas that would prevent children from being denied life-sustaining care through DNR (Do Not Resuscitate) orders issued without parental knowledge or permission. Kansas parents that we have been conversing with about an important new bill, Simon’s Law, are absolutely stunned to discover that a DNR (Do Not Resuscitate) or DNAR (Do Not Attempt Resuscitation) order can be placed in a child’s medical chart without the permission of any parent. Simon’s Law is named for a case of this tragic deception which happened to the Crosier family five years ago. Simon, their three month old son with Trisomy 18, died due to a DNR order that was neither discussed with, nor permitted by, his parents. Simon’s death happened in St. Louis, but his dad is a Kansas native, with many extended family members who are Kansas residents. While KFL was actively educating about Simon’s Law, new relevant scientific articles about this DNR/DNAR issue have been published. The article I will discuss here, published March 17 in BioEdge, reveals the shocking results of a survey of neonatologists— those pediatricians with special training in newborn intensive care. In essence, physicians entrusted to evaluate and treat infants in critical care situations willingly expressed their opinions that it is ethical for them to deny care “unilaterally” (without parental consultation and permission). Granted, these survey results came from just one sixth of the 3,000 members of the American Society of Pediatrics Section of Perinatal Medicine who were sent surveys, but it surely is frightening. · 25% said a unilateral DNAR order would be permissible based solely on neurological prognosis. The many testimonies submitted to the Senate Health & Public Welfare Committee in support of Simon’s Law demonstrate that children have tragically died based on negative “quality of life” assessments by the medical community– particularly children with chromosomal disorders—even Down Syndrome. Some physicians, in the context of highly expensive remedial treatment, believe they are responsible for “taking the matter in hand” and ending the life of a child whom they consider a burden, but whom the parents see as a gift. Highly negative medical labeling–profiling– of both the unborn and newborns as “incompatible with life,” regularly occurs, in spite of evidence to the contrary from those with such conditions who survive for months, years and even decades. Simon’s Law will protect lives threatened by medical discrimination and usurpation of parental rights by pediatric specialists claiming an “ethical” basis for denying life-sustaining care. The compelling and gripping story of Simon Crosier and his family’s decision to choose life is featured on the homepage of the National Right to Life, right below Pope Francis’ statement about the controversial subject of abortion. Sheryl Crosier’s story about her Trisomy 18 son was originally published in the Missouri Right to Life and, as a result, was picked up by the national organization. The story of Simon Crosier is featured in the highly rated book “I Am Not a Syndrome – My Name is Simon” published by All Star Press – Books that Change Lives. Click here to read the 1 page summary of Simon’s story that was recently featured in the Missouri Right to Life newsletter. Order Simon's Book today. 5-star rated book on Amazon!